Looking at me now, you'd never guess I was born crippled. 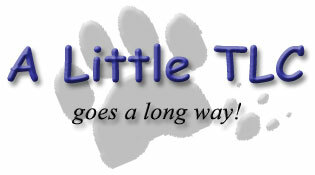 That's because a little TLC goes a long way. My name is Bendy Cute Kitty. I would like to tell you my story, and the story of my half siblings and housemates. forever loved, remembered, and missed. A Special Thank You To a Wonderful Teacher! ON 3/17/02, LEGUME PASSED AWAY. WE WILL NEVER FORGET OUR WONDERFUL ZOOMIE 'GUMIE. It is with a heavy heart that we say goodbye to the one who inspired us to save the cats others would give up on. Kim Thunderwolf, my friend and inspiration, left us on 11/16/08. 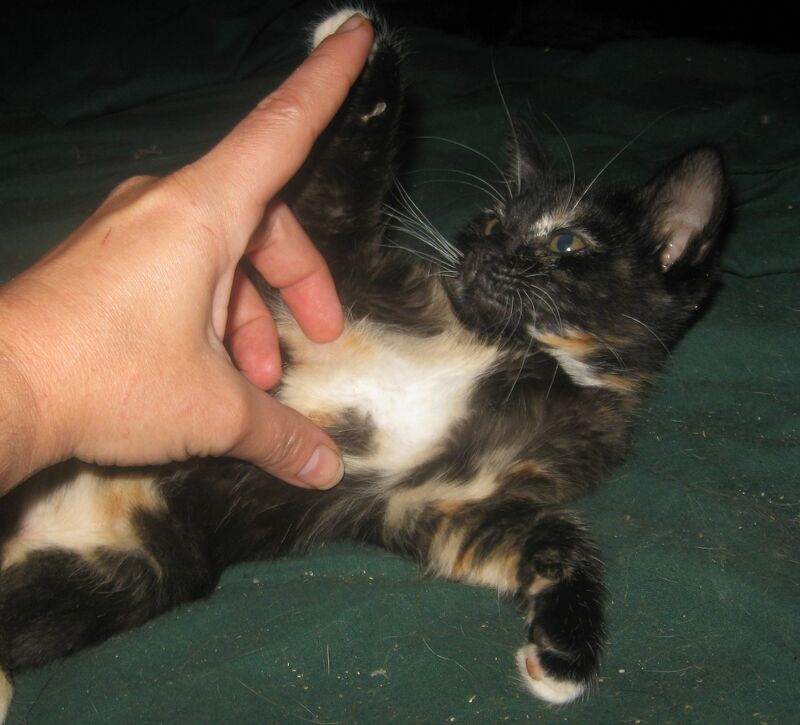 Her kitten Peanut taught me that sometimes even the seemingly impossible could heal and live well. Kim, Bendy's Home is a living tribute to you. 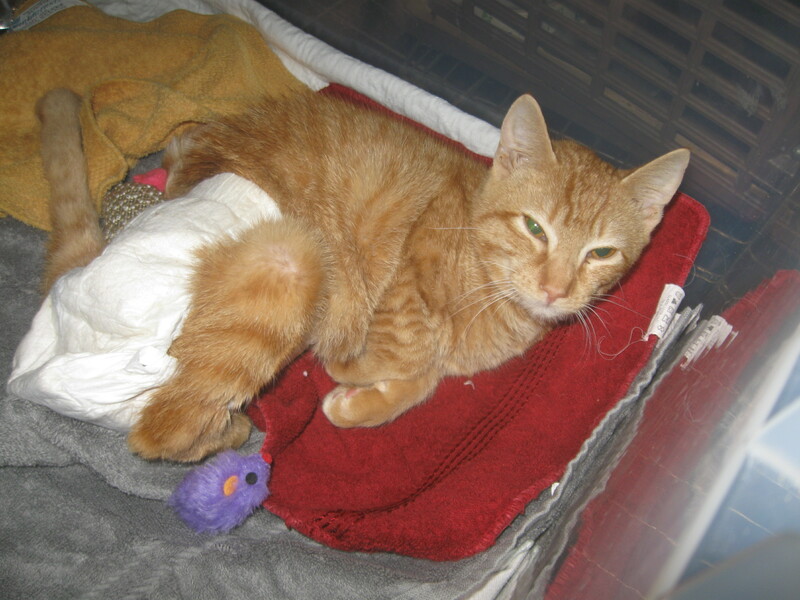 An amazing little cat, Valentine, found badly injured but somehow survived. Meet the other special needs felines in residence. Six Toes, my half sibling. in March 2013 SixToes was diagnosed with right heart syndrome which is controlled with amlodipine. Hermes, my other half sibling. 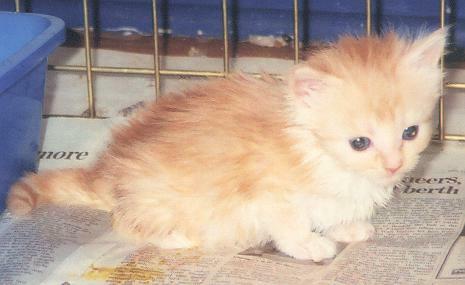 Ghiradelli Chocolate Drop, the brain damaged kitten. Butterbean, our incontinent cat with deformed hind legs. Enki, who has subluxing patellas and hip dysplasia. He takens Adequan and is doing extremely well. 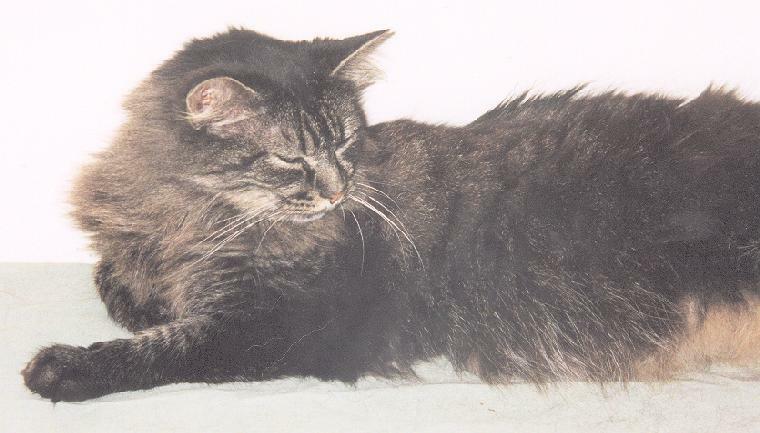 Black Cherry Whisniak was found hiding in a stump by the side of the road with her sister. 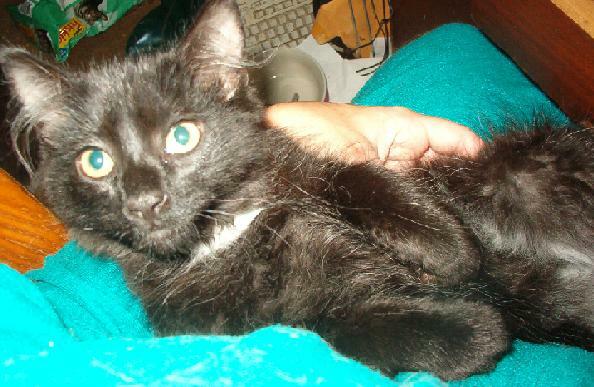 She was rescued by some kind people in Maryland, who went to www.handicappedpets.net to find her a home. She has deformed hind legs and is only partially continent. She is a sweet, happy and very mobile girl! Tierseas, came from a feral colony with a severe herpes eye infection. He is now mostly blind, but super sweet and gets around just fine. There are other cats that live with me, too. Even tho they don't require special attention, they are an important part of my life! Sadly, Legume left us on 3/17/02. He will be dearly missed. Legume's last few months in detail. Sammi died 6/31/02 of a spider bite. Mattie, the thrown away kitty. 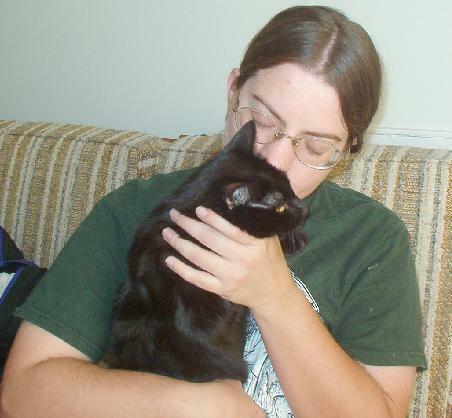 We were sorry that we had to say goodbye to Shadow on 11/29/06. He had been diagnosed with a very aggressive mouth cancer on 11/14. For his last week we had a houseguest who stayed in his room, we're glad she was there for him while mom was at work, and snuggled with Shadow every night. We had to say goodbye to Maggie on 07/28/08. 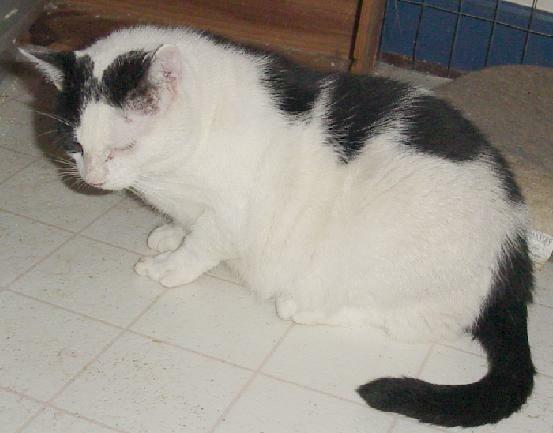 She had been declining despite our best efforts to treat her arthritis and one day could not even stand up. Her hips and shoulders seem to have completely given out. We are glad we were able to give her a home for her last years. She had been turned in to a shelter at the age of 16, the shelter staff did not like her because she kept making a mess of her cage. Mom heard about her and took her home, where she proved to be a very sweet, loving girl and wonderful companion. Mimosa started out as a foster but joined our family. She was brought to the shelter with a shattered leg, that was only the begining of her problems. The Emergency vet told mom "I know you can do this" and Mimosa recovered more every day. We had her for seven years. She was worth all the time and trouble. The Amazing TwoBit, the two legged kitty. I am very sad to say Two Bit passed away on August 26, 2011. She suffered a brain aneurism and mom came home to find her dead. The vets say it was very quick and nothing could have been done. We miss her very much! 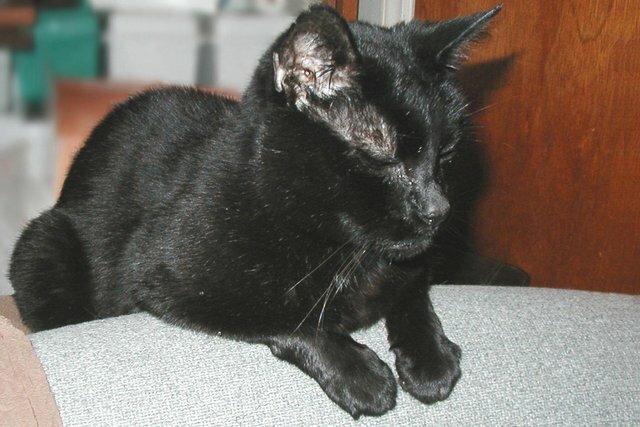 This black kitty has had nothing but bad luck! Jean-Claude became very ill in January 2012 and was found to have a mediastinal mass. He left us on January 11. We miss our little nose nurser. 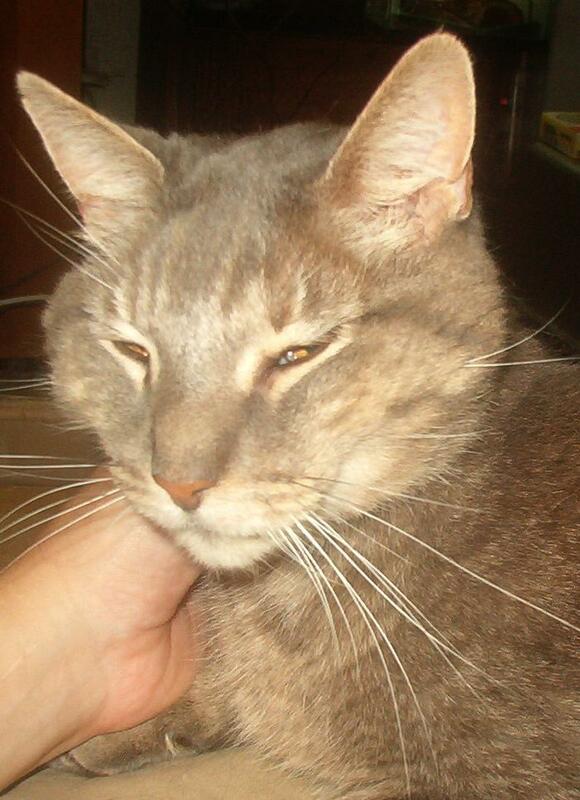 He was our first FIV+ cat, a tom trapped on the street. He had broken toes and a bb under the skin but was a loving boy. 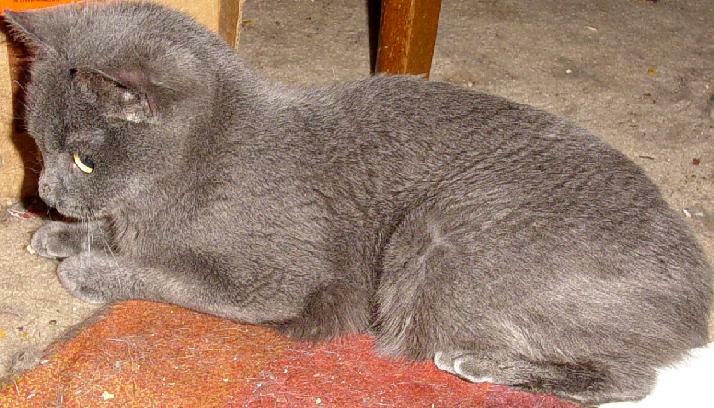 He left us in January 2012, he is very missed and his room upstairs will always bear his name. 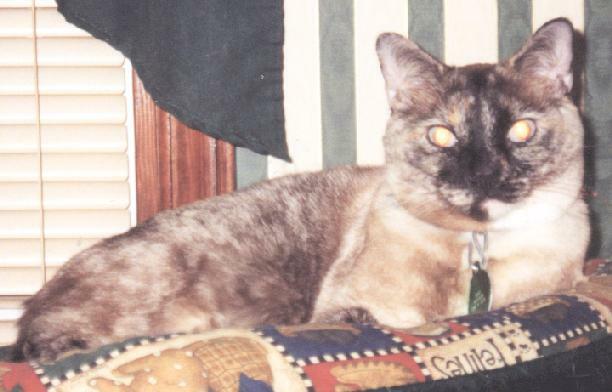 Bastet also called Bastiebast ruled the house with an iron paw. 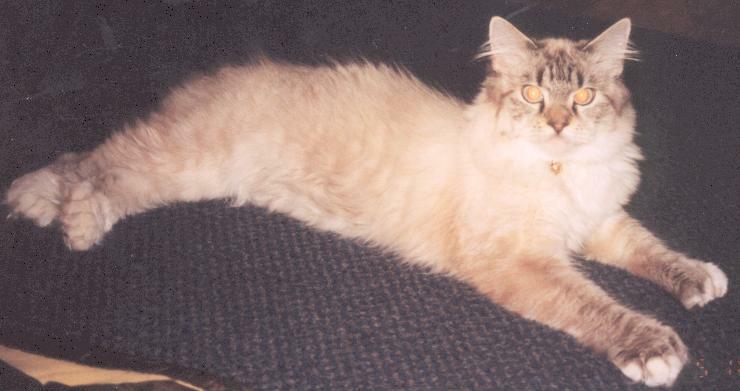 She came to me at 6 weeks old in May 1996, and left January 2, 2012 while I was away. I miss my counter prowling, sink drinking, attitudinous but affectionate to me girl! BABY was a bottle baby from 2002 that mom couldn't say goodbye to. He loved to nurse on a hand and expected to be cradled on his back. 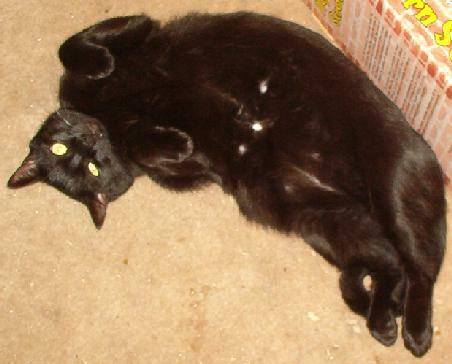 He loved to be kissed on the head and belly, have his belly rubbed, and snuggle. 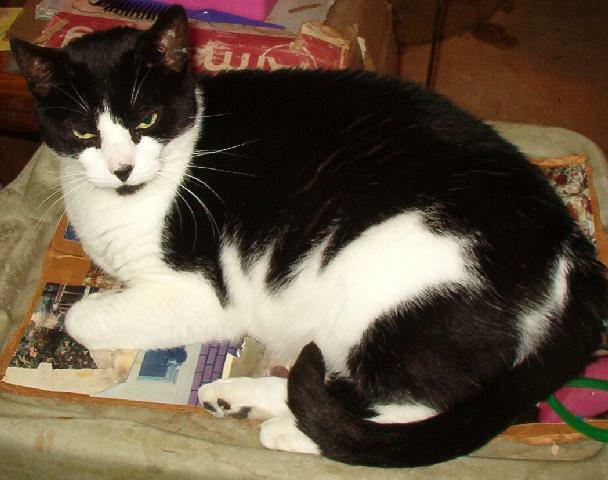 We often called him our "big fat tub of love"
He left us in May 2013, after developing lymphosarcoma. It was very widespread by the time it was noticeable. ANU is the kitten that us cats invited in. 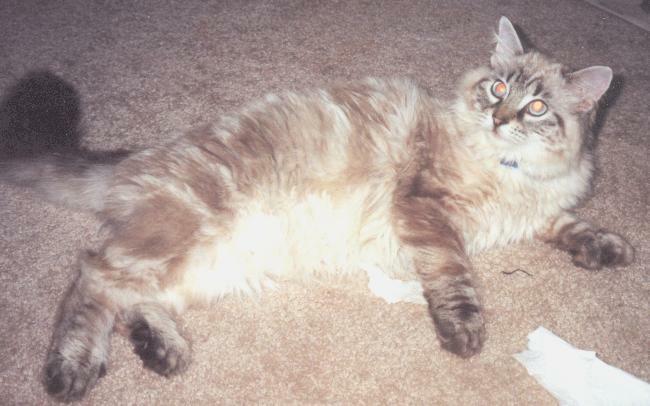 Early in the morning, about 4am, on February 2, Mom heard some mewing in the laundry room. 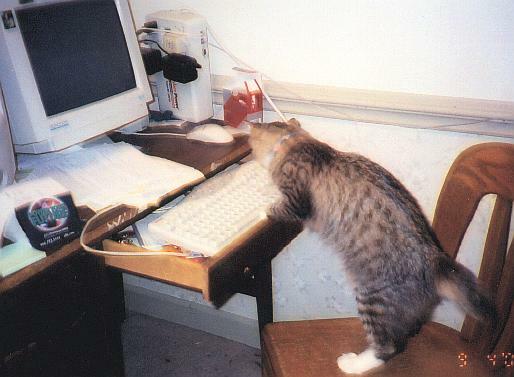 "But I don't have any kittens." she thought. 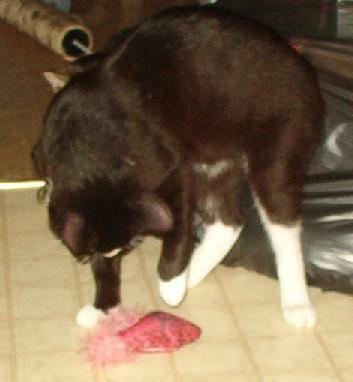 IttyBittyKitty answered and in trotted a little tuxedo kitten! He went right up to IttyBitty, headbonked her, tussled with her, then followed her to the food! "This isn't your first time here." Mom said. He must have come up on the porch and wiggled through the chainlink of the cat pen. 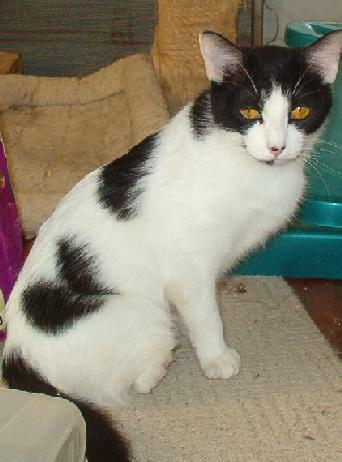 He gets along well with all the other cats, but remained uncertain of Mom much of the time. 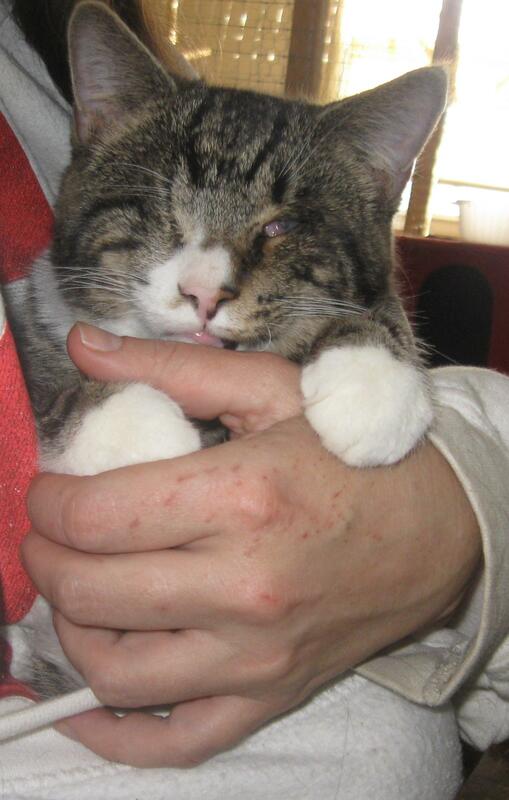 He became suddenly extremely ill, was rushed to the emergency vet but it was too late. All his organs were failing. We do not know what took our little boy from us in March 2013. I miss my little ninja kitty! I like to receive e-mail! You can ask me questions, tell me stories, send suggestions and/or pictures, or just say hello. I will try to respond as quickly as I can.